The whole purpose of business reviews is to give potential customers the ability to make an informed decision when inquiring about a given business. This allows them to set realistic expectations, which is especially paramount to ensuring that you can maintain a positive image as a contractor or construction business. Learning how to remove fake reviews is important in an industry where reviews hold so much power. The problem is that not all reviews are authentic. Fake positive reviews can be as hurtful as fake negative ones, as they can put unrealistic expectations on your business and cause future negative reviews. Given that marketing is a careful balance of ensuring fair business practices and maintaining a positive public image, this can harm your business tremendously. What can you do about a fake review from a competitor? There’s plenty of things you can do. Let’s examine all the steps you’ll need to know to remove fake reviews from Yelp, HomeStars, Google and others. The first step to removing fake reviews is to identify them. While this sounds simple, it’s a step that requires an amount of effort that scales with the number of customers your business has. The easiest way for smaller businesses to watch their online reviews is to make use of things like Google Alerts. This allows you to receive notifications within a few hours to days of new reviews being posted about your business. If you have a larger business, then you’re going to have to make looking for fake reviews a full-time job. 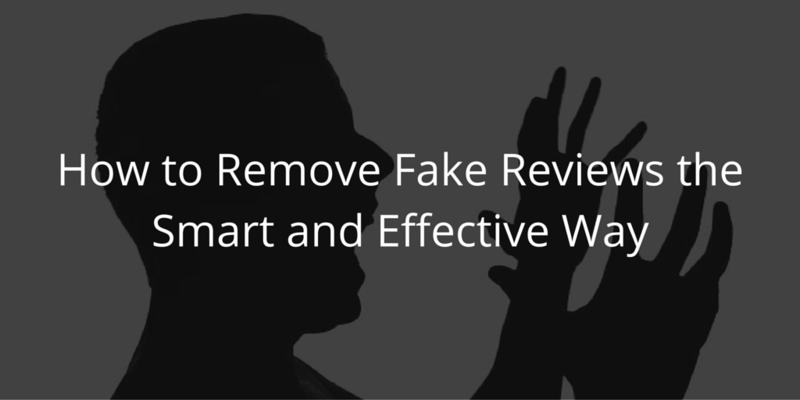 Regardless of how large your business is, quick identification of fake reviews will allow you to begin the removal process sooner. This will minimize the amount of damage that these reviews can cause. Before you begin motioning for removal of fake reviews, you need to understand that not all fake reviews can be removed. Some websites like Yelp have incredibly strict guidelines that will only allow reviews with a clear conflict of interest or that contain hate speech to be removed. Some places like Google won’t remove fake reviews simply because of the influx of things that they have to do each day. This is why getting fake reviews removed can sometimes be an incredible challenge. The good news is that some fake reviews can be removed. You just need to understand that not all reviews can be removed, as failure to do so can lead to an incredible amount of frustration. When you find fake reviews that violate the what a review website allows, then you can begin reporting those reviews. this is the part where due diligence becomes essential to removing things that could potentially tarnish your company’s reputation. There are two common cases where you can usually remove reviews: if those reviews were made by a competitor or if they were made by a professional reviewer. The best way to go about doing this is to first register your business as verified with the review website in question. This will enable you to begin researching people who have left reviews on your business. You should then look at the profiles of people whom have left reviews. Normal people will leave a handful of reviews in one set geographic area while parties writing fake reviews will leave several negative reviews on multiple businesses around the country. When you spot these, flag these reviews and cite your evidence when you can. Some places like Yelp will give you a set selection of options to make this process easier while others will require you to explain the violation briefly. Another common reason to flag reviews is when they do not apply to a customer’s experience. Fake reviews written based on an opinion expressed by someone working for you can usually be flagged and successfully removed. When you can’t remove fake reviews, the best thing you can do is to respond to them. The difference is that you should use your responses as a way to educate other readers of reviews rather than treating those reviews as one written by an authentic customer. For example, imagine that your business received a fake review from a local competitor. Instead of lashing out at that company, you would do better to respond with something describing the situation. Outline how fake reviews hurt honest customers trying to pick the best provider for their needs. So long as you keep your customers are the forefront of your responses, your company will always win out when competing with dishonest competitors. You can create similar responses if those fake reviews were written by unhappy former employees or other parties who were never actually your customers. The last thing you can do to protect against fake reviews is to begin building a solid reputation that can’t be shaken by even the most determined of competitors. The challenge in doing this is that it takes more effort than trying to remove fake reviews. Reputation management requires you to change your business in such ways that allow it to become more trustworthy and more reliable towards fulfilling the needs of your customers above anything else. This means taking the assumption that states “The customer is always right.” to heart. When you do this, you can begin encouraging your customers to leave honest reviews. This will allow the quality work you should be performing as a contractor or construction business to be rewarded with positive reviews that help to further the goals of your business. You’ll also minimize the incidence of reviews like the bad homeowner review. You’ll minimize their impact while allowing an overwhelming number of positive reviews to shine forth. Continuing to build this kind of unshakeable reputation will make fake reviews ineffective against your business. You may be able to reach the point where fake reviews are flagged by customers who were impressed by the way your business operates, which means that you may reach a point where fake reviews become regulated by someone else. Receiving a fake review from a competitor is anything but the end of the world. Learning how to remove fake reviews can be from flagging them for removal, refuting them, and, if you’re working on your reputation management like you should be, allowing them to be drowned out by an overwhelming number of positive reviews. Just keep in mind that fake reviews hold a small amount of power compared to authentic reviews left by customers. If you remove them when you cane and respond to them in an informative way, you’ll minimize their impact while allowing your business to focus on serving your customers better.